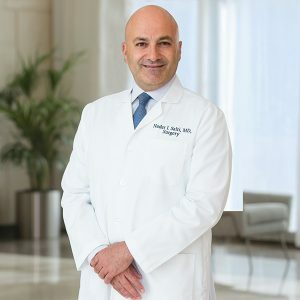 Dr. Nader Salti is certified (1999) and recertified (2008) by the American board of surgery. He is an associated fellow of the American college of surgeons and a member of the American medical association. Dr. Nader Salti received his college and medical degrees from the prestigious university of Chicago, Chicago, USA(1989, 1993). He completed his general surgery residency training at the University of Rochester, Rochester, NY, under the tutelage of Dr.Seymour Schwartz, one of the giants of American surgical scholarship (1998). Subsequently, he finished subspecialty fellowship training in colon-rectal surgery at the university of Illinois and cook county hospitals, Chicago (1999), under the direction of surgeon pioneer Dr. Herand Abcarian. For the next decade Dr. Salti was in private surgical practice in the Chicagoland and Wisconsin areas. His calling to Dubai has allowed him to reach one of his passions in life, and that is helping as many multinationals as he can under one "roof". Please call for appointment or write Dr. Salti directly at [email protected] or Call the Call Center of the Emirates Specialty Hospital (www.eshospital.com)in Dubai Healthcare City at +97142484500 and ask for appointment with Dr. Nader Salti directly.